“I have created one of the complete sets of paintings that can be found freely on the net. And I hope many amongst you will benefit from all this stuff”. You must agree that when an open source software gives a tough competition to the very best and premium software, then it ought to be very good in doing what so ever it does. We are talking of GIMP, a cross-platform image manipulation program that provides you flexibility to transform images into anything you ever imagined. You can further enhance your productivity, thanks to a plethora of customization options and third-party GIMP plugins. GIMP Paint Studio (GPS) is one such GIMP add-on that provides you with a pack of designing components like brushes, palettes, patterns, gradients, tool preset etc to provide a convenient workplace and flexibility to the designers. So, let’s find out what all it offers!! 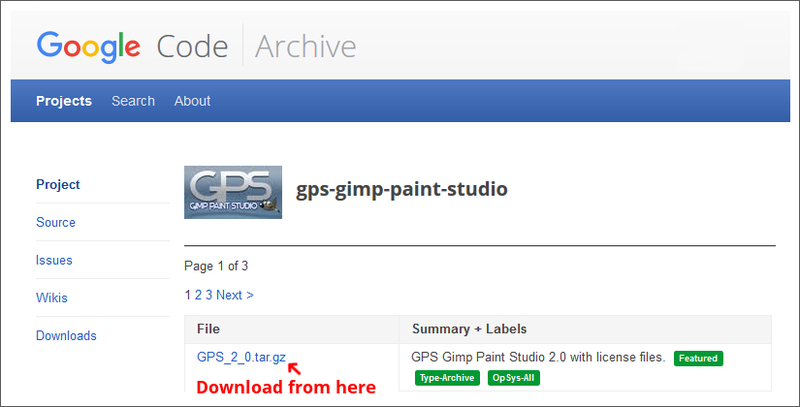 Step 1: Download GIMP Paint Studio by visiting this link. A zip file will be downloaded. Step 2: Unzip it and extract the files out. You are going to get all these files and folders inside the unzipped folder. Step 3: Now copy all these files & folders and paste in /home/”username”/.gimp-2.8 folder. Click on “Merge” when asked to merge all the files and folders to the existing folders by same name. Step 4: Launch/Restart GIMP. You will find following Brushes, Gradients, Patterns, Palettes etc. menus available in GIMP. Step 1: Download GIMP Paint Studio by visiting this link. Step 2: Unzip the Compressed folder. Step 3: Copy the Contents of the compressed folder to C:/users/”username”/.gimp-2.8. Step 3: Launch/Restart GIMP and you will find following Menus available in GIMP. Now, let’s have a closer look at what are we getting with GIMP Paint Studio. GIMP Paint Studio is a nifty pack of different designing components that improves painting experience for GIMP users. 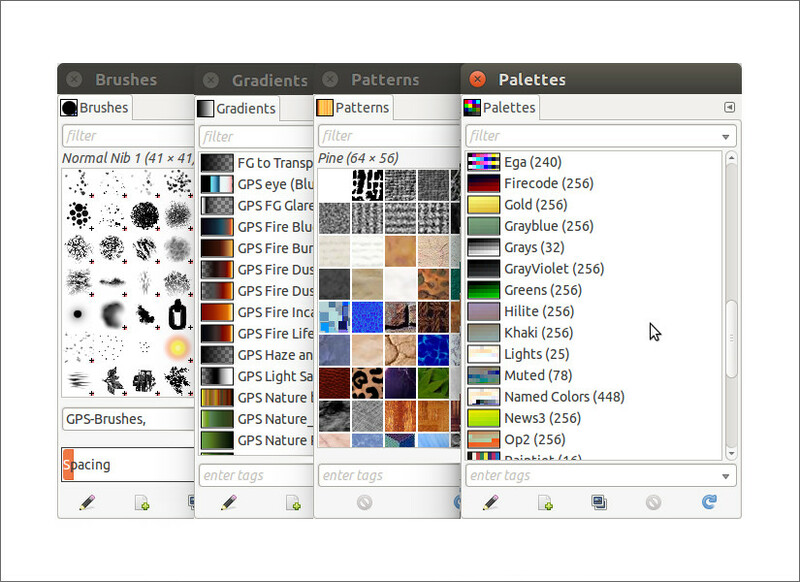 It is a collection of brush, palettes, tool presets etc for the free and open-source program GIMP. GIMP Paint Studio adds those components to the GIMP which it lacks in the default set. This provides the users the flexibility to create beautiful paintings. In many cases default set of tools is not enough to meet the needs of advanced users. Thus, it becomes very important to have an advanced collection of tools for such purposes. GIMP Paint Studio is the go-to pack for every graphic designer, in such a situation. It helps in creating unique and beautiful looking images easily and very precisely. 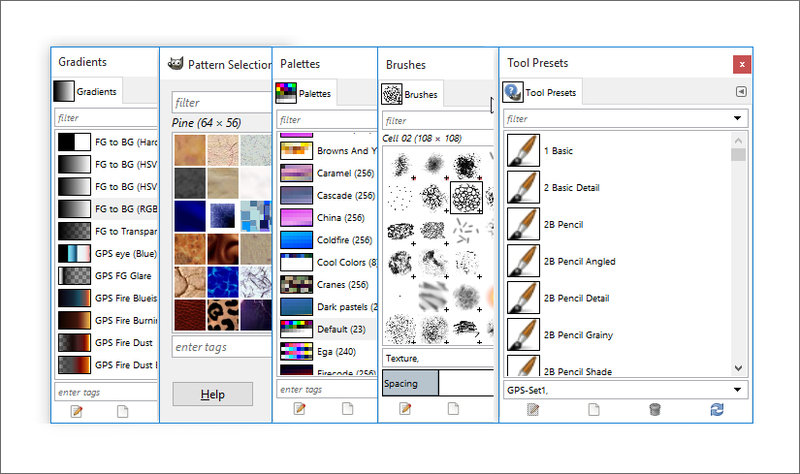 There are 102 different types of Brushes in GIMP Paint Studio to enrich your painting experience. Also, there are 16 Gradients, 12 Palettes and 28 Patterns in this pack. Other than this there are 64 painting dynamics in 6 different categories: Eraser, Fx, Sketch, Smudge and two distinct sets (Set1, Set2) of presets to work with GIMP. Also, there is 79 tool presets in 8 different categories: Eraser, Fx, Ink, Sketch, Smudge and two distinct sets (Set1, Set2) of dynamics to help you paint in a better and effective way. GIMP Paint Studio is a very handy tool and can be used for a number of tasks, such as painting, erasing, blurring, applying special effects and a lot more. It is a very useful painting tool and once you get familiar with it, you can create unique and world class creations. This is all about GIMP Paint Studio. You should definitely try your hand over this very tool and make beautiful creations on your own. You will definitely love it.